Find out how Pulse Policy Secure substantially lowers risk to a financial network you already thought was secure. Pulse Secure CEO Sudhakar Ramakrishna discusses details about the Pulse MSSP program with CRNtv. This paper provides a background on Software Defined Perimeter (SDP). Learn about NAC 3.0 technology, dynamics, and innovation, along with best practices on how to implement. Orchestration of connectivity, protection, visibility, and threat response across mobile, network, and cloud. 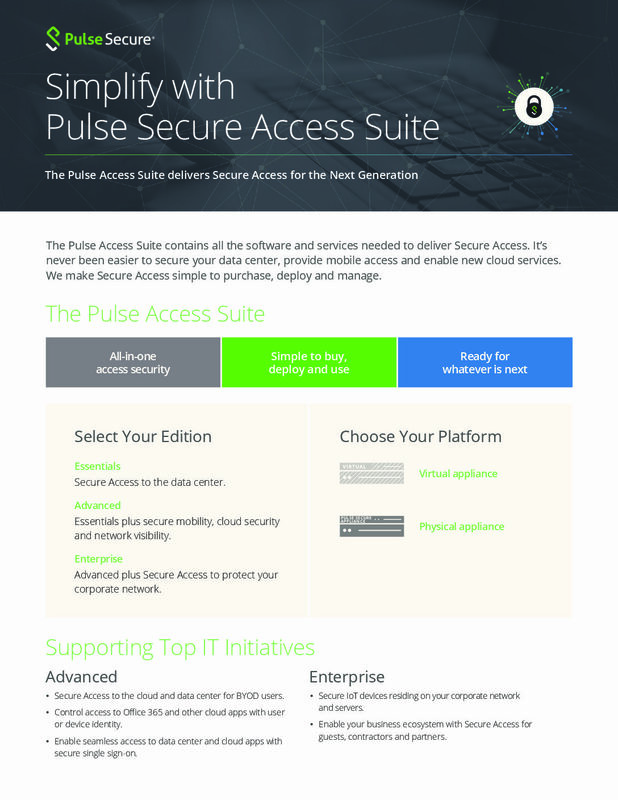 The Pulse Access Suite contains all the software and services needed to deliver Secure Access. It’s never been easier to secure your data center, provide mobile access and enable new cloud services. We make Secure Access simple to purchase, deploy and manage.